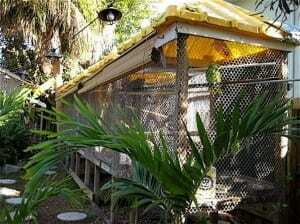 Melbourne Avian Rescue Sanctuary (M.A.R.S.) 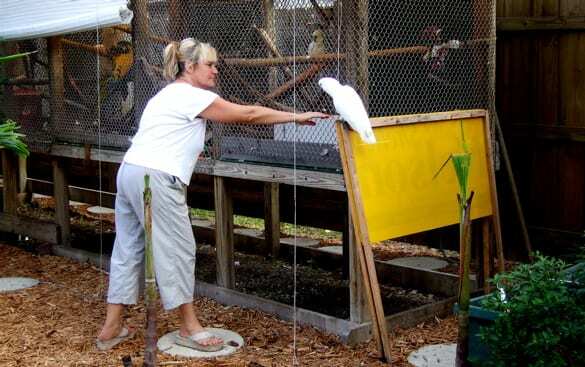 was formed completely out of love for exotic parrots by Melbourne Beach long time resident LuAnn Apple. There was a tremendous need for a place to exist on Florida’s space coast. A place to meet these needs of placing, rehabilitating, and providing a home for unwanted exotic birds to flourish in a healthy tropical setting. We officially came into being on February 28, 2008. We received our much awaited I.R.S. letter of exemption in September of that same year. 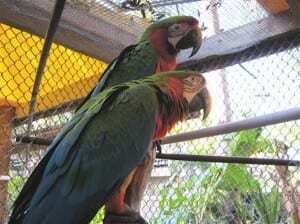 Birds in the aviary of M.A.R.S. Our mission is a simple one. Strive to teach people what went wrong with their choice of an exotic bird, and possibly what they can do differently to make it right. We have learned through experience that ones first choice of exotic isn’t always the right one for their situation, and throw in the personality differences between exotics within the same species, and you possibly have a recipe for failure. It is our highest priority to match the right individual or family to an exotic bird that will bring years of joy to both. The all volunteer staff of M.A.R.S. strives on a daily basis to concentrate on the well being of each and every exotic that is in our care. We allow them freedom to fly, to sit in trees, to feel what it’s like to get a bath from real rain. We promote interactions between members of different species, and as you can imagine this will make for some great stories to write. We are hoping that you can find it in within your means to help us continue with the work we do here at M.A.R.S. It is our heartfelt wish that through our pictures and stories you will see the need for help and support both monetarily, and through sharing your stories with the interactive features on our website (i.e. your comments in our blog, your thoughts and inquiries sent via our contact form). We will try on a weekly basis to answer all questions on bird behaviors and human behaviors, related to exotics of course. We hope that the web presence of M.A.R.S. will be visited by all who have a love for these amazing creatures we now know are so very complex, and so many times highly misunderstood. Their means of communicating with humans is sometimes lost in their translations. So once again we ask you to come fly with us, share our joys and sometimes our failures. It is always a learning process, if we just choose to learn. We have 2 birds, a cockatiel and a dusky conure, what we are unable to keep much longer. It seems I am allergic to the dander. Do you know of anyone that I could contact who might want these birds? There will be no charge and all cages/food/etc will go with them. We have 2 birds, a cockatiel and a dusky conure, who need a home. I seem to be allergic to the dander or something with them all of a sudden. There will be no charge and all cages/food/etc are included. My brother currently have 11 lovebirds in his house. He wants to sell them but I don’t want to do that, I would love for them to be in a place like this. Please let me know if this is something that you can help me with, I can provide food/cage, just let me know. I did not choose but inherited my mom’s beautiful Indian ring neck parrot and would Ike to give her to be rescued to a nice family as I travel a lot. Please help. Did you find a home for her if not we have one who would love to be her forever home. Email me marsparrots@aol.com and we will set a day and time to do so. I’m curious as to how many birds you have placed into a new home from adoption? How many birds do you currently have up for adoption? I am looking to adopt a bird as opposed to buying one because so many already need a new home. If you email marsparrots@aol.com I will put you in touch with a woman who wants to adopt a Moluccan and you can give me more info too. Hello. I am interested in volunteering here over the summer and I was just wondering if you also take care of abandoned fledglings as well as older more mature birds. I have a 3 year old female lovebird named Loki and a 2 year old male Green Cheek Conure named Ion. My birds are my babies and I love them deeply, but I ended up becoming allergic to them and my health has been getting increasingly worse with other conditions going on. I don’t want them to suffer because of me and want to put them in a rescue. Can you please point me in the right direction? I have a 8 year old Blue & Gold Macaw. I have to give him up and would love it to go to the awesome sanctuary like yours. I was given this Macaw about a month ago, my neighbor had him in her dark & hot garage because she couldn’t take the screaming and the mess he makes. I felt sorry for him and brought him home, but I cannot keep him for many medical reasons.I have many surgery and I will soon be going to surgery again. Will need to give him away as soon as possible. Could you please help me with this rescue. Just a quick update from MARS. Got to meet Willie and trim his nails and beak and he is a doll. Thank you for trusting MARS to help you. Gina is keeping me posted on his progress. No yelling from him what so ever. I would like a bird companion and would like to know what steps I have to take to be an owner. I provided respite to an owner of a white umbrella cockatoo, female. The owner chose not to take her back.and now I need to find a forever happy home for her. She is female, and has had two owners, prefers females to males, but had both. She is between 25-30 years old. She is adorable, cuddly, sweet and needs attention. Can you help? Marjory, please send an email to marsparrots@aol.com and we will continue with this conversation. Look forward to helping you. Sorry I did not see this sooner….